With the school year back in full swing, fall sports are probably not too far behind. 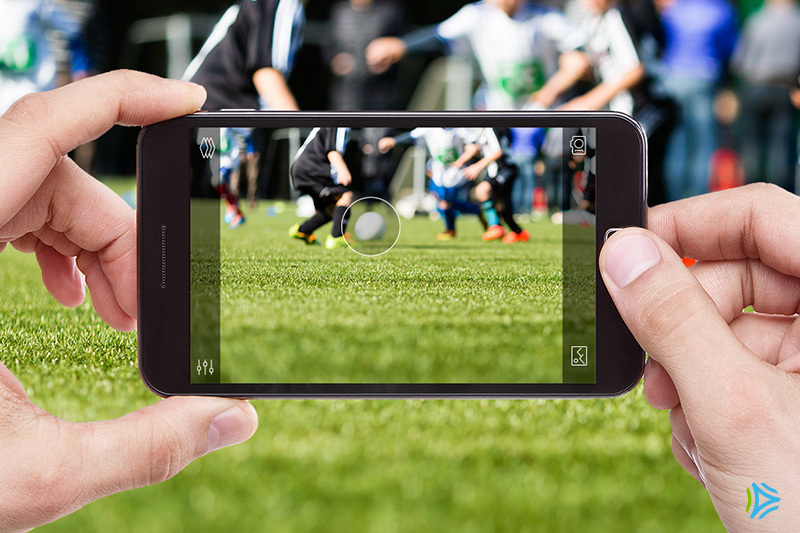 And with fall sports for kids comes the challenge for their parents: How to capture that perfect action shot on their smartphone. Whether it’s Timmy’s first goal in soccer or Sally’s buzzer-beating jump shot, the action shot can be one of the most difficult pictures to capture. Still, with a little preparation and our top 5 tips, your smartphone can perform as well as a very good digital camera. The camera in your smartphone was built to be a great general camera—not a specialty device for taking action shots. Still, if you want to capture your kid in motion, turn on burst mode, which allows your phone to shoot multiple frames per second, increasing your likelihood of getting at least one or two clear shots. On most iPhones and Samsung phones, burst-mode shooting occurs when you hold down the shutter button. You can also check your camera settings to switch into burst mode. If it turns out your smartphone doesn’t have it, you can download any number of burst mode apps for iOS and Android. Zooming with a smartphone—where you pinch on a figure and the figure becomes larger—isn’t really zooming in the same way you enlarge an image with a traditional camera lens. It’s just blowing up one portion of the image, to the detriment of the image’s overall quality. Don’t be afraid to get as close as you can to the action. Then, once you’ve captured the image, crop the photo for a dramatic framing. The key to a great action shot is to constantly be on the lookout for the most decisive moments in the game, such as the fast break in basketball or the corner kick in soccer. The best sports photographers wait for these moments to unfold, and are ready when they do. Being able to effectively predict action requires a working knowledge of the sport you’re watching, so you’ll get better and better at this if you pay attention to the rules and rhythms of your child’s favorite sport. Action shots are easy enough to capture when the weather is great, but what’s a picture-snapping parent to do on a cloudy day, or when the big game is indoors? Take a few still pictures before the game starts to see what you’re dealing with. If the scene appears too dim, increase the exposure to allow more light into the sensor. You can do this on most iPhones by tapping and holding on an image until a square appears, then tapping the sun icon next to it, dragging the slider until you’ve got a brighter image. One Androids, you just want to tap the sun icon and adjust the slider between -2 and +2. And if the big game is taking place indoors, turn off the flash. You won’t want to distract the players! One of the great things about having a camera feature on your smartphone is that you never have to think about film or processing, so feel free to take as many shots as you want. Then, after the dust has settled, you can look at what you’ve captured and think about what to leave in and what to crop out. Remember, just like in sports, practice makes perfect.